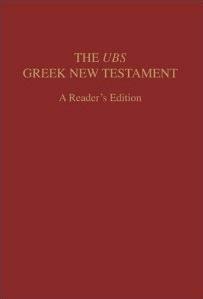 The UBS Greek New Testament: A Reader’s Edition. Compiled by Barclay M. Newman. Stuttgart: Deutsche Bibelgesellschaft, 2007. 732 pages. Hardcover, $69.95. In an age where computer software can call up a biblical passage in seconds, define every word, parse every verb, and cross reference any relevant passage, what role does a new edition of the Greek New Testament play? In this context, a student of the Biblical text can quickly become reliant on these “tools” and lose the ability to read the Greek of the New Testament naturally and fluently. The editors of The UBS Greek New Testament: A Reader’s Edition seek to remedy this tendency by providing a volume designed to help a reader become competent in the Greek of the New Testament. The editors are convinced that the primary way to equip the next generation of New Testament scholars is to ensure that “there will be those who can actually read the text without undue dependence upon ‘tools’” (7). They argue that to master this skill, “there is simply no substitute for linear and sustained reading” (8). The primary features of this volume are intended to encourage this practice. One immediately noticeable aspect of this edition is its size. At 732 pages, the book is admittedly large. Compared to the sleek softcover of Zondervan’s A Reader’s Greek New Testament, the hardcover of this volume seems somewhat bulky. This exterior also makes it clearly recognizable as a Greek text. 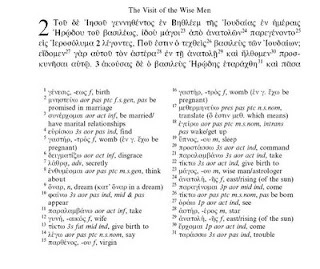 If you take this Greek Bible to church with you, it will be readily apparent that you have done so. As this edition is intended for reading and devotional use, these features are somewhat unfortunate. Despite these initial concerns, this volume may prove the adage, “You cannot judge a book by its cover.” The content of this edition outweighs any aesthetic deficiencies. Users of the UBS Greek New Testament will recognize the similar layout and format. The font selection and size are easy to read, the margins are spacious, and English headings are included at major sectional breaks. The pages are also thick and smooth resulting in easy page-turning and minimal bleed-through from the adjoining page. Also helpful is the format of the footnotes at the bottom of each page. The notes are broken up into two columns and are centered within the width of the text. The spacing between the columns makes finding a particular note or word a simple task. These features enhance the text's overal readability, an improvement over A Reader’s Greek New Testament’s thin pages, thin font, and vocabulary footnotes in paragraph format. Concerning content, the Greek text used is from the most reliable and regularly cited UBS Greek New Testament, the standard in New Testament studies. The features that make this volume a “reader’s edition” are the centerpiece of the book. In addition to defining the word, the footnotes provide the lexical form as well. They also give the parsing of difficult verb forms, the declension of most nouns, and even the rendering of uncommon idiomatic expressions. This enables the reader to develop proficiency in both grammar and vocabulary. The concise lexicon at the back of the book includes the definitions of words that occur more than thirty times, which are excluded from the footnotes. With this added help, the reader can account for every word in the New Testament canon. In contrast to these definitions, the ones given in the footnotes are contextual, meaning the editors choose the most probable sense of a word rather than list the full range of semantic possibilities. This particular feature enables rapid reading, but also involves interpretive decisions on the part of the editors. In the large majority of cases, the rendering fits the context and does not affect the meaning of a passage. Though, in some instances, the linguistic decision is significant. To give one example, the editors render hilasmos in 1 John 2:2 and 4:10 (cf. Rom 3:25) neutrally as the “means by which sins are forgiven,” avoiding the choice of either “propitiation” or “expiation” along with their respective connotations. This concern could be considered minor in light of the edition’s purpose of aiding fluent reading rather than nuanced interpretation. As its subtitle suggests, the goal of this volume is simply to help people “read it.” The editors accomplish their task by providing a resource that functions as a useful transition to the independent reading of the Greek New Testament. If revelation is located in the very words of the Scriptures themselves, then accessing them in their original language is indispensible. This volume will greatly aid the reader pursuing this task in the portion of special revelation written in Greek. In SWJT 52.2 (Spring 2010), 187-88. Also at BaptistTheology.org (October 2008).